Christina Clare is at once a chanteuse, a musician, artist and designer. She originally made her mark on the New York scene in 2007 as half of the critically acclaimed performance art duo, HiChristina! on the Lower East Side where she set up shop selling reconstructed vintage clothing. The Orchard Street storefront soon became a destination for downtown performance art and became the first of many storefronts she and her partner, Fritz Donnelly would inhabit as a home for their revolutionary, fun and free-spirited happenings. Featured in the New York Times, Rolling Stone, Women's Wear Daily and The Huffington Post, HiChristina! was crowned TimeOut's Most Stylish New Yorkers. This past winter Christina released her first solo vocal album with living jazz legend, Joel Forrester, and also plays with friends and New York luminaries Alexa Wilding and Larkin Grimm. Always classy and always on the cutting edge, Christina's dynamic live show is a synthesis of high art, fashion, Bach arias, her original music, and interactive, edgy fun. This spring, we had the distinct pleasure of hosting an evening with Christina Clare. 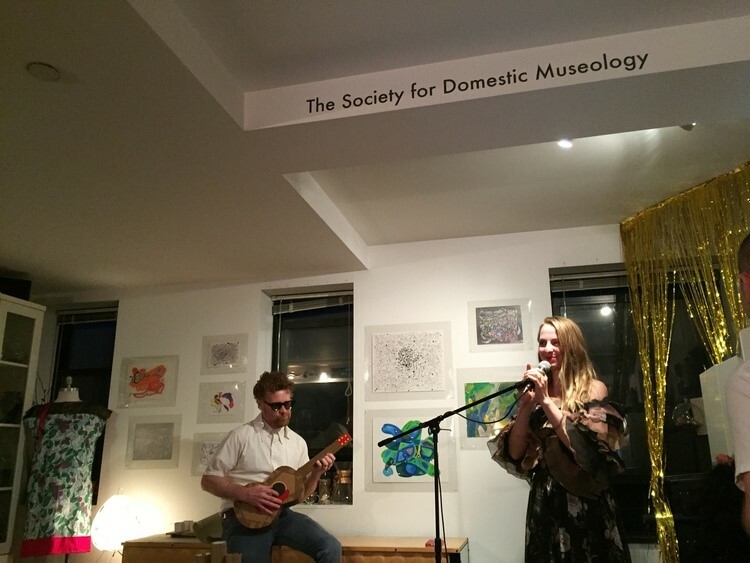 As our 10th artist at the Society for Domestic Museology, Christina conceived a multifaceted program that included an exhibition of drawings and an original tunic on a dress form that provided the backdrop for a performance that encompassed opera, jazz, original songs, and audience participation. I had some trepidation about hosting a concert in our small living room, but the truth is, Christina could perform almost anywhere and it would be magical. And that's exactly what it was.